The press room on the last day of the Tokyo Game Show was dead. I spent the afternoon in there, finishing up some stories and just when I was leaving, I spotted a slick Mercedes Benz. I stopped, pulled out my camera and got ready to snap off a quick photo to send to my car crazy son. I never took the photo of the car, because its owner emerged from a corridor. The car belonged to Tadanobu Asano. I got a photo with him instead . Outside Japan, Tadanobu Asano is one of the country's most famous actors. Like Ken Watanabe of Inception fame, Asano has made the leap to big time Hollywood motion pictures. He's also a great actor with fantastic range and tremendous screen presence. Asano starred in the Oscar nominated Mongol, appeared in Kenneth Branagh's Thor, and is slated to appear in the upcoming movie version of the Battleship board game and 47 Ronin with Keanu Reeves. Asano showed his acting chops in edgy flicks like Ichi the Killer and non-Hollywood productions like Invisible Waves. Yet, when I asked the security guard if he knew who Asano was, I got blank looks. "Surely, you've seen some of his movies, right?" I asked. "He might have been in a Suntory whiskey ad." Nope. He had no clue. Neither did the female cosplayer who was dressed as Final Fantasy VII's Cloud. Neither did ten or so Japanese friends I emailed the pic to. My in-laws knew who he was—they own Mongol on Bluray. My mother-in-law even knew Asano was doing voicework in a video game. How she knew that, I'll never know. Asano was at this year's Tokyo Game Show. He's lending his voice to the game Shadows of the Damned—a game he told me to go buy. Joining him is actress Chiaki Kuriyama of Kill Bill fame. Asano and Kuriyama are famous in Japan, sure, but not so famous that everybody knows their names like Shinsuke Shimada or Smap. Hollywood fame doesn't necessarily translate to success in Japan. While Ken Watanabe is hugely popular, Rinko Kikuchi, who was nominated for an Oscar for Babel, still isn't a household name. If anything, she's viewed as an actress who made it big abroad, but who isn't popular at home. In Japan, it all comes down to television. According to Kuriyama, the reason that she's not more famous in Japan is because she largely appears in movies. In Japan, television is king. If you don't appear on silly variety shows or in commercial after commercial, then fewer people know who you are. It's the opposite of the West, where movie stars rule the roost. Asano does do commercials, but doesn't appear in Japanese television dramas, which is probably why his face didn't exactly leap out at people. One female friend later told me, "I'm a huge Asano fan, but I didn't recognize him without long hair." 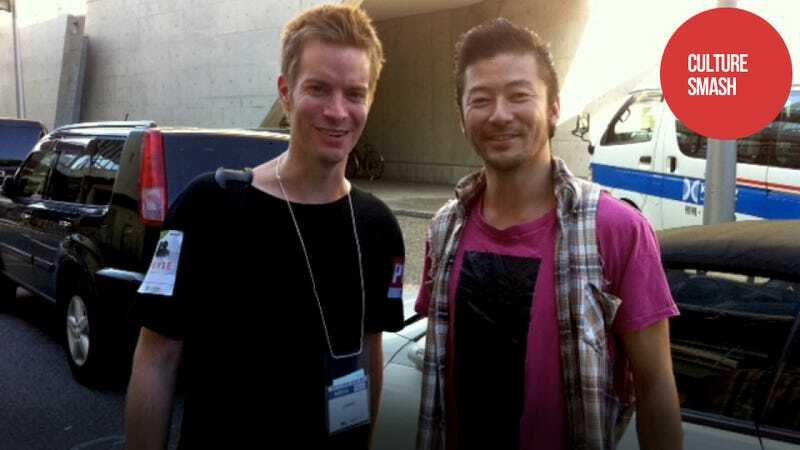 Of course, Tadanobu Asano does have his fans in Japan. In many ways, he's the Grasshopper Manufacture of the Japanese entertainment industry. When I told foreign friends that I saw him at TGS, they were far more excited than the Japanese pals I told. It made me wonder, would Shadows of the Damned with Asano's Japanese dialogue subtitled helped the game's foreign sales? No offense to Steven Blum, but Asano has much more name recognition abroad. Asano might consider himself too cool for shoddy Japanese television dramas, but this past Sunday, he wasn't too cool for TGS.